It’s been a long year since I voted to set up a new country more or less from scratch, and unsurprisingly there’s a lot of chat about having another go. What are the triggers? Who gets to decide when we decide? What, in great detail, does Nicola think about it? All good questions. But let’s admit what underlay many of the weaknesses last time: the SNP’s one-party majority at Holyrood, the very thing which led to a referendum in the first place. Yes Scotland was seen as just a rebranded part of the SNP, and on policy issue after policy issue, the media (disingenuously but understandably) treated the SNP’s specific independence prospectus as a gospel summary of how independence would look. The broader Yes campaign diverged from the SNP on many issues, of course. Greens (and RIC, and the SSP) had, for example, probably a less popular position on the monarchy, one which I am proud of still. Take one example. You can understand the thinking behind the White Paper’s currency policy. Folk wanted to keep the pound. The focus groups urged it. So the Scottish Government decided to back it. But in practice, the policy amounted to giving your deadliest enemy a loaded revolver and saying, “please don’t shoot me with this”. The rest is history. Osborne pulled the trigger. Salmond foundered in the first debate with Darling. Credibility was never demonstrated or gained. We lost. I could go on. Over and over the SNP’s position got confused with the reality – i.e. that the Scottish people would make those key decisions in the first election to an independent Parliament, and at subsequent elections. Neither the currency nor the monarchy would or could have been settled by a Yes vote: both would be decisions to be made later, questions about what kind of independence we want, which would no doubt evolve. This confusion is still happening today: for just one example, the thoughtful Sunder Katwala blurs the two here. Now it’s entirely up to the SNP to offer a monarchist Scotland, and to say they’ll seek to negotiate a shared currency with Westminster. Both are respectable positions – although I think the latter of those helped sink us. But as long as they have a majority all their own that position will be seen as what Yes2 is all about. A Scottish Government where they are the largest partner but share power with the only other party at Holyrood which supports independence would be entirely different. Such a coalition wouldn’t be able to produce a White Paper2 which just set out SNP policy, nor one which promoted Green policy. Such a document would instead have to say “those decisions will be made by the Scottish people in subsequent votes, if we vote Yes this time”, and simply to list the options. It’s stronger, it’s more winnable, and it’s more honest too. So, if what you most want is for the SNP to continue to govern alone, and you would rather one or two more SNP MSPs plus eight to ten Labour MSPs instead of a dozen Green MSPs, please do vote SNP with both ballots. But if you’d rather both a Greener government and a more realistic prospect of independence, whenever those triggers are met, I’d urge a Green list vote. We can’t do it without them, clearly. But they can’t do it without us either. This entry was posted on September 18, 2015, 2:51 pm and is filed under Elections, Parties. You can follow any responses to this entry through RSS 2.0. Both comments and pings are currently closed. The fundamental problem with “those decisions will be made by the Scottish people in subsequent votes, if we vote Yes this time” is that it only appeals to those who want independence for the sake of independence. The referendum showed that most voters are not interested in that. They’re voting for what they think is best for themselves, their families and their communities. To do that, they need to know what they’re voting for. In the absence of any concrete vision of what an independent Scotland will look like, they will continue to vote for the devil they know. The other problem with this ‘broader independence campaign’ is that it’s not as broad as it thinks it is. 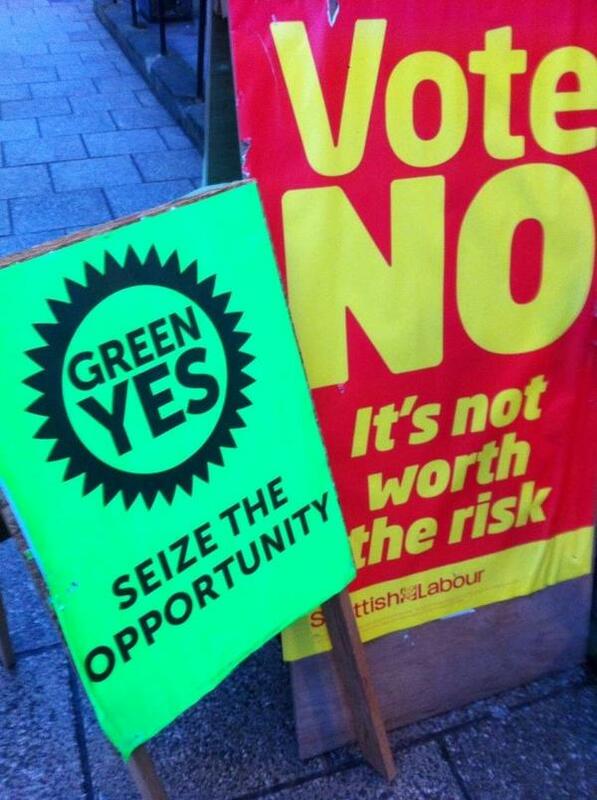 Will the Greens campaign alongside a group supporting unconventional gas extraction? Will the SSP work with a group that favours active membership of NATO? RIC with a group that proposes a low tax, entrepreneurial Scotland? Otherwise “those decisions will be made by the Scottish people” will really be interpreted as “the Scottish people will choose from one of the options we propose” which allows the pro-union campaign to exploit the uncertainty and selectively quote the extremist options. So do you really want the full debate or do just want the usual Left wing echo chamber? I’d really prefer the full debate. If there was a centre-right party that wanted lower taxes and worse public services but which supported independence I think that’d be healthy for the next indyref. “Those decisions will be made by the Scottish people in subsequent votes” is as open to attack as a currency union. Reporters will not accept that as an answer, and neither will the electorate. Can you show me the maths in your calculation of seat gains and losses please? Because everything I’ve seen shows that the only way the Greens gain a dozen MSPs is if most of the SNP voters vote Green on the constituency vote. If a small, or even a largish chunk of SNP voters switch, then we lose the “one or two” SNP MSP, but don’t gain any Greens.